~~> You’re the hottest new fashion stylist in Hollywood, and your awesome reputation is already bringing you fame and fortune! ~~> Work with famous fashion models and VIP celebrities. Bring out their star style! ~~> Create tons of incredible looks for your clients - find them the perfect outfits for their big events! Welcome to Hollywood - the land of VIPs, where fashion rules and all the celebrities and famous models need to look amazing to keep up their star status! That’s where you come in - you're the stylist to the stars! Everyone’s talking about the hot looks you created at the latest red carpet event, and now you’re clients are piling in! > Open up your very own Hollywood stylist office and become famous! > Style and dress up your VIP clients (supermodels, famous movie stars and more!) in glamorous outfits! > From magazine cover shoots to red carpet movie premieres, it’s your job to make your clients wow the crowds! 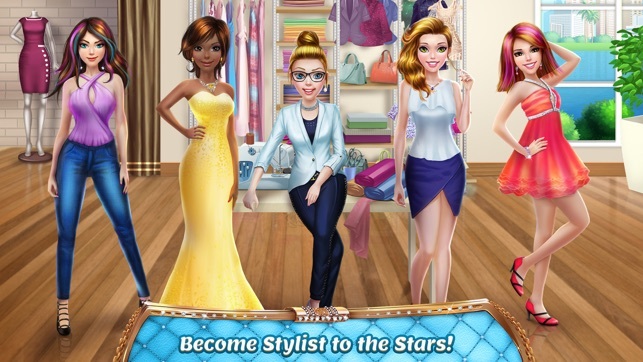 > Find fabulous clothes for your models from the trendiest stores - Chick Shack, Party Fever and Stardust, and add perfect accessories to complete their outfits! > Make sure their nails are perfect - add cool stickers and nail jewels, and complement their manicures with rings and bracelets! > Help your models win lots of fashion catwalk and photoshoot contests! 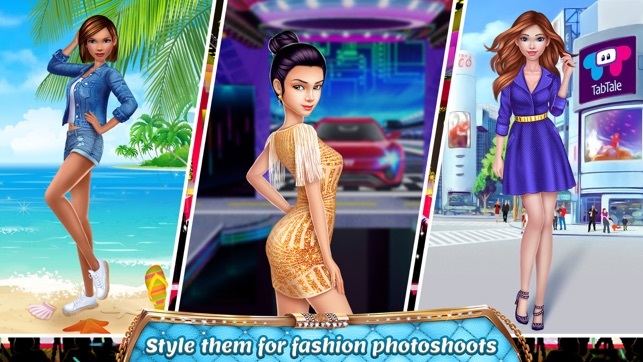 > Play fun fashion and stylist minigames! > Collect coins as you style! > Eeeewwww! We can't stand those nasty bugs. We released them to the great outdoors. > What do you think of our game? Send us feedback! I downloaded Mall Girl, an app very similar to this. It’s fun, and gives you lots of options if you don’t have the Full Version. But, because the Full Version isn’t that expensive, I got it. But still, the Mall Girl app... I don’t know. It just wasn’t that exciting. Or addicting. 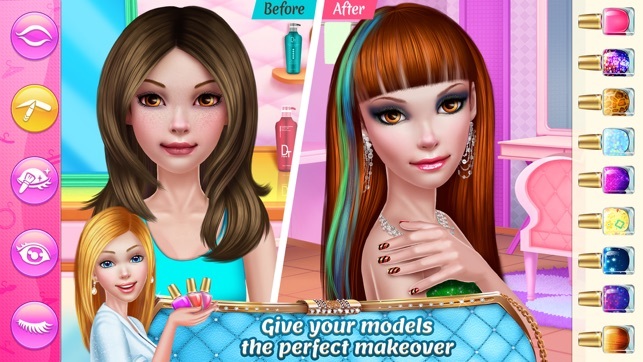 I was searching for makeup apps when I saw this. I downloaded it immediately. It’s very similar to Mall Girl, but this one was better. A huge step-up. I love, unlike other apps, the people are 3D, so it looks like real life!! I got the Full Version, and I’m addicted to it. I’m the top of the leader board!! 1st Place! !🥇🥇🥇🥇🥇🥇🥇🥇🥇🥇🥇🥇🥇🥇🥇🥇🥇🥇🥇My only concern is that no matter what, your character wins the contest. Maybe it comes with the Full Version, but I don’t like it. I designed a person really bad to see what happens, and I won! I tried again, same thing! I don’t like this! So all my hard work is for NOTHING!!!!!!!!!!!! PLEASE fix this! This app is super fun for my 5 year old twins I even tried playing it myself so random people come and you have to pick outfits for them just like I have to do with my kids 😂 but my girls find it really fun but my son not so much he makes them dress like they are rappers and then he loses but he always wants to pick the car theme one after that he’s done with the game my girls Lizzy and Izzy find it really nice but in a few years their gonna probably turn into this game in real life and my son is 9 years old my husband tells my daughters to play on the iPad when he’s cooking dinner he says every time he looks their out of trouble but again this app is good for young little girls and this is fun and helps them stay out of trouble.